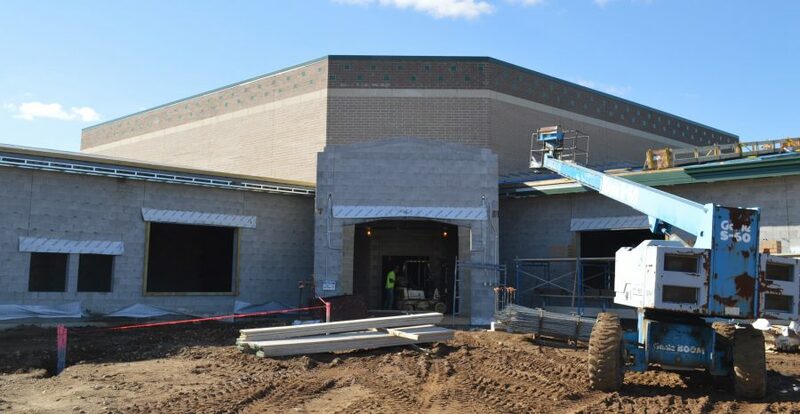 Shown is the main entrance to the new Syracuse Elementary School. The top portion looks closer to what the finished product will look like. SYRACUSE — Less than a year from now, barring any major obstacles, students and staff will fill a brand new elementary school in Syracuse. Work is progressing well and even ahead of schedule at the new Syracuse Elementary School on Kern Road, projected to be ready for the start of the 2017-18 school year. A milder than normal winter where work was not interrupted nearly as long as might be expected in northern Indiana meant work is nearly two months ahead of schedule, said James Flecker, Wawasee Community School Corp. attorney. “That will be nice at the end if they need to do any change orders or fill punch list items,” he said. All of the foundation walls at the site are in place and now work is being done on the metal studs in the walls. Initial roofing is covering about 90 percent of the building and it is hoped all of the initial roofing will be finished before winter. Concrete has been poured for some of the interior flooring and outside brick work is in progress. The building will sit sideways because it is a better fit for the site for parking, Edington noted. There will be a lot of angles in the building. “It gives more window space looking to the outside,” he said. Angled roofs will be used too. There will be a main hub at the entrance with the reception area, principal’s office, media center, technology office, multi-purpose room, bookkeeper, nurse, conference room and more. Coming off the main hub will be separate wings for each of the grades from kindergarten through fifth. Each grade will have a bathroom. On the other end from the hub will be the cafeteria and gymnasium. Edington noted the cafeteria will comfortably seat 275 and that will be larger than the cafeteria used at the current Syracuse Elementary. In the gym there will be two floors with a curtain coming down between the floors to allow for two classes at the same time. A small set of bleachers will be on one end and a larger set on the other end. A rougher winter this year could affect the work schedule some depending on how much of the building is enclosed. If workers are able to get to the site, interior work can progress through the winter months assuming enough of the building is enclosed. NIPSCO will provide gas service and REMC is providing electric. All lights inside and outside will be LED. Fetters Construction, Auburn, is the general contractor.